Matrixyl 3000 Peptide, Organic Gota Kola, Organic Kakadu plum, Hyaluronic acid and organic Aloe Vera, proven to hydrate, stimulates elastin and collagen production. Eye Contour: Pat gently around delicate eye area morning and night to sooth and calm puffy eyes. A pea size amount of this cream is all you need for both eyes. 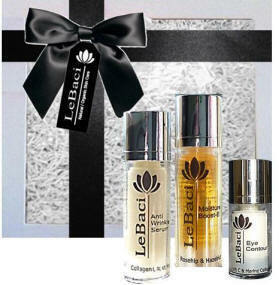 Anti-Wrinkle Serum: Apply 1-2 pumps only to cleansed face, under eyes, décolletage and neck morning and night. Moisture Boost-E: Apply a pea size amount over Anti-Wrinkle serum morning and/or night. © 2009 Le Baci. All Rights Reserved.